Video games are the violins of popular entertainment. To play them requires knowledge and skill. To play them well requires practice and maybe a bit of advice. We want you to enjoy video games, so we have some advice. Our helpful tips are for anyone who is about to press a button, kill a mini-boss or match three gems. Our advice is for people who have never played video games before and for people who just finished re-making Mother 3 in Minecraft. Our advice is for the world's best Call of Duty players and the world's worst as well. If the game you're about to play has a numbered sequel, play the sequel. Unlike movies, the first one usually isn't the best. Keep a dulled fish filet knife near your gaming area. It makes opening shrinkwrapped game cases and the obnoxious DVD box seal on modern video game boxes so much easier. 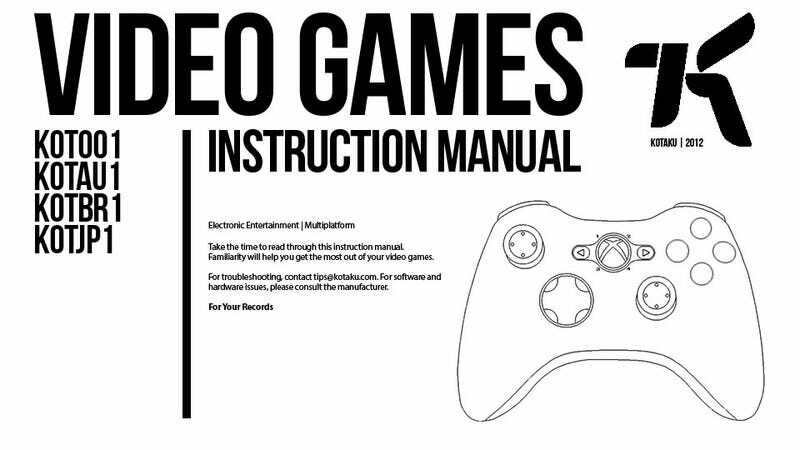 Don't read the instruction manual. The best games explain themselves. ALWAYS invert the Y axis. (No, don't!) (Yes, do!) Maybe consider inverting the Y axis. Turn the lights off for horror games. In sports, unless you have played this game—in video game form—for two or three years already, just set the difficulty to rookie. You'll learn faster and have more fun. Don't be afraid to play on "Easy"; games are for fun, not self-flagellation. If a game is condescending towards you for playing it on easy, turn it off and return it. Don't be a masochist; crank the in-game brightness setting so you can actually see that the logo/icon without straining. If you can, play the game on PC. Be attentive to what the game designers are trying to tell you and look for in-game clues and cues. Always explore, because you're almost never really on the kind of hurry the game says you are. In a role-playing game, talk to all non-player characters, just for the 1/100 chance they'll say something interesting. In a 2D sidescroller, first go left and see if they've hidden anything over there. Experiment with turning off or minimizing the mini-map and the heads-up display; the game may be more fun if you have less information available to you. Give the soundtrack 60 minutes to impress you. If it doesn't, mute it for a podcast or TV show. Mute all menu music (if it's an option) after a day. This is especially important in sports video games as you spend a lot of time in menus during the season modes. Check out the control-layout screen a couple of times once you've been playing a new game for a few hours. It will probably remind you of one or two moves that you haven't been using and could experiment with. Until you have a good sense of how generous the game is with auto-saves, manually save often. Do an autosave stress-test early on where you find out when the game actually saves. Don't overwrite the same save file throughout the game—make a new save every so often, since you never know when you'll want to undo a few hours' worth of decisions. But limit your overall save file count, maybe to four, to give yourself options but not too many options. Turn subtitles on when you really care what's being said; off when you really care how it's being said. If you get the option, play the game in its original language. It's good to give games out of your comfort zone an honest try; genres cross-pollinate in weird ways. But its okay genuinely not to like something and just walk away. If you find yourself frustrated with a particular boss or action section, mute the sound and focus on the action on-screen. Don't let a game beat you; if you're getting angry, put it down and come back later. Ask a friend for help with a tricky puzzle, then ask Twitter, then check GameFAQs.com, and only then consider consulting a strategy guide for help. Before deciding to skip multplayer, play one mode on one map for one hour and see if you like it better after that. When playing games online, don't say anything you wouldn't say in front of your mom. Mute anyone who didn't take the preceding advice. Wait instead of paying. If the game stops you mid-session and gives you those two choices, deciding to wait will both save you money and will help ensure that game is really worth playing again. Don't let the game brag about you. Don't bother with motion control unless that is the only way to play the game. Steer with buttons or wheels, not by tilting the controller or the phone because the latter is just too unreliable. Don't waste your time with the wrist-strap. When playing on the bus, take an inside seat so that you can hide your super-groovy handheld wonder machine from potential muggers. Check Google to see if you're playing a clone. If you are, play the original instead. Use headphones, not the system's speakers. Dim brightness to save battery life. Go into airplane mode for the same reason. Be sure to check if the game has more than one control option. Sometimes the default touch-screen controls aren't the most comfortable or responsive. Turn off Twitter notifications. No one cares. Bravely set the 3D slider to max—and nudge it down from there. We've got plenty more advice, but that should help you out for now.